You’ve got a top-notch service department filled with qualified, customer-focused advisors and technicians. You have state-of-the-art technology in the shop, and your facilities are spacious, attractive, and pristine. Yet if you’re a typical dealership, despite your sterling service department, you still struggle to convince more than half of your new-vehicle buyers to return to the dealership for service. Your revenue from fixed operations is pretty good, but you know it could be better. You feel like you’re leaving money on the table. What’s the problem? Most likely, the problem involves how you’re getting word out to your customers. If you’ve turned your service department into the friendly, convenient, and reliable facility that your dealership’s buyers would feel confident about and happy to return to, you need to make sure they know about it. That’s why service marketing begins from the moment buyers step out of the F&I office with their paperwork and the keys to their new set of wheels, then continues the rest of the way through the ownership life cycle. Reaching every stage of that life cycle requires a multichannel service marketing approach that involves communication through your employees, website presence, email, social media, and much more. Fortunately, as with most other aspects of modern dealership operations, technology makes it much easier to deliver the multichannel service marketing messages that today’s customers expect. And once you get their attention and turn it into an ongoing dialog, they’ll keep coming back if your service department delivers—which you know it will. To dig deeper into the fine points of service department marketing, Dealer Marketing Magazine interviewed three industry leaders, who share their knowledge gained from years of experience helping dealerships maximize the potential of their fixed ops departments. Thank you to Jeff Hart, president and CEO of OneCommand; Bill Wittenmyer, partner at ELEAD1ONE; and Jim Roche, senior vice president of marketing and managed services at XTime. Dealer Marketing Magazine: Overall, how well do you think new-vehicle dealership service departments are currently performing in terms of revenue generation and customer satisfaction—are they close to realizing their potential, or leaving money on the table? Jeff Hart: A dealership’s service department is the life source of the entire store’s operations. According to NADA, in 2015 new-vehicle dealerships produced three times more net profit in their service department than they did in their new and used departments combined. Also since 2006, and through the recession, service revenue has actually increased. These numbers prove automotive dealerships are focused on their service department’s revenue numbers, and are providing high-quality customer service. Not to mention, most OEMs are keying in during a customer’s purchase and/or ownership life cycle to check on satisfaction levels [to ensure] the dealership is providing top-notch care. What we do see is a general misunderstanding among consumers that a dealership’s service department is more expensive than an aftermarket facility. However, what consumers don’t always consider is the dealer is using genuine parts and the technicians are significantly more qualified, and certified to perform the services required. A huge opportunity in the coming year is for automotive dealerships to educate consumers, correct misinformation, and recapture market share that has been lost to independent service facilities. Bill Wittenmyer: With every department, you have varying levels of performance depending on the dealership culture, management philosophy, and focus on business goals. Customer demand is prevalent in our market, and many stores have enhanced their service departments with additional staff and sales processes that improve the customer experience and provide additional revenue-generating opportunities. We also see these dealers expanding marketing efforts by embracing a multichannel approach to target fixed operation customers with vehicle-exchange programs, maintenance, and service repair. [This includes] websites dedicated to the service department, as opposed to a coupon/incentive pop-up that often gets lost in the content overload on the main dealership site. Alternatively, other stores continue to do business as usual, with no increased marketing focus on fixed operations. And yet, both types of dealerships are making money, so we need to look at the larger picture of business, and not just profit. A great example is our experience with the increased number of safety recalls. If stores have not increased capacity in the service lanes, then they are making a choice between new expansion and organic business—just taking what comes in for service. A natural increase in demand has evolved with several years of positive business growth. Stores that have not adapted may find schedules overloaded, with increased carryovers, and stress on completion dates, which inherently affects CSI and the ability to increase customer pay and/or conquest business. Jim Roche: There’s still a big opportunity for dealers to get more revenue from their service operations. The best way to improve service retention—and increase profit—is to create a service experience that makes customers want to come back. Unfortunately, the industry’s average owner loyalty rate is only 51%, meaning most dealers lose one out of every two customers. Plus, fewer than one in three service visits takes place in retail automotive dealerships, even though they sell 100% of new vehicles and are the only authorized providers of warranty repair and recalls. If dealerships can provide a better experience, the potential for increased service retention and profit is huge. DMM: What are the most effective ways for dealers to build loyalty among its buyers and keep them coming back to that dealership for service, instead of straying to other dealerships of the same make or independent mechanics? JH: The simplest answer to this question is: Consistent, relevant, and informative communications keep customers coming back. The truth is most consumers need a reminder to have service work performed on their vehicle, or that they declined a very important service the last time they were in the dealership. This reminder can come in the form of an email campaign, personal phone call, text message, direct mail, social message, etc. Typically utilizing more than one channel to remind a customer of needed service work is preferred, but also making sure that all communications are well branded and contain consistent information about the dealership should be a high priority as well. Putting the dealership’s brand in front of customers when it’s time to have service work performed drives top-of-mind awareness, which is the first step in building customer loyalty. When communicating vehicle maintenance reminders, be careful that the timing of the marketing is relevant to the individual customer, and is delivered through their preferred method of communication. If a reminder communication is delivered too early or too late in an ownership’s maintenance cycle, the dealership risks alienating that customer and becoming another irrelevant marketer. In most cases, dealerships have an advantage over their competition when delivering relevant marketing because they know when that vehicle was last serviced, and therefore can predict when that specific vehicle will be due for service again based on that individual’s driving habits. By communicating with customers at key touch points in their ownership life cycle with relevant, seasonal marketing and competitive offers, dealerships ultimately build loyalty and keep customers coming back over and over again. Lastly, dealers should educate customers about the benefits of doing business at their OEM-authorized service facility. They should sell the advantages of having factory-trained technicians and genuine parts in their marketing to further build loyalty and eliminate defection. BW: Customer experience is the biggest factor. Most dealers do a great job of providing excellent amenities and friendly facilities. I know a dealer that even added a “Manicure Monday” to attract more female clientele. However, the most important part of the experience should focus on the actual servicing of the vehicle. Today’s consumers want a convenient way to maintain vehicles around their schedules, not the dealership’s. Further, they want experiences to be efficient and timely, resolving the service needs they came in for in the first place, perfectly. If you combine convenience with competitive pricing that does not necessarily include a discount, then customers will come back for the exceptional experience. Because every consumer has time and scheduling pressures, they want the knowledge and confidence that service and maintenance will be done correctly the first time. Also, too many dealerships today still do not mandate the sales team walk new-car buyers through service with a personal introduction to the director, who can answer all service-related questions—all before driving off the lot in their new vehicle. JR: The most important thing dealers can do to improve service retention and customer loyalty is to focus on delivering a high-quality ownership experience. When it comes time to service their vehicles, today’s drivers have plenty of choices. Dealers have to deliver the value, convenience, and trust their customers expect if they want to be the go-to service provider. Otherwise, customers will find someone else who does. There are plenty of ways dealers can improve the ownership experience: price transparency, for example, or convenient online scheduling options. Making these changes will help dealers gain loyalty and win customers from the competition. DMM: What is the most common complaint customers have with the service departments where they bought their new vehicle, and how can it be remedied? JH: Time and time again, we hear consumers complain about the lack of communication from their dealership. This seems to be particularly evident after the purchase of a vehicle, when consumers feel like dealers don’t make the necessary follow-up communications to ensure their purchase experience went well, introduce them to the service department, and inform them of ongoing maintenance needs for their vehicle with competitive service offerings. Without this life cycle of communications to recently sold customers, many dealers are experiencing defection. It’s not difficult to follow up with every customer about the purchase of their new vehicle, and dealerships should be aware that consumers are expecting this behavior. With [OneCommand’s] Loyalty solution, these life-cycle communications can be automated, and are unique to each consumer and based on their individual driving habits. Dealerships need to remember that for many Americans, a vehicle is the second-largest purchase they will make in their lives. The good news is there are several vendors in the automotive industry that provide this type of automated follow-up, so dealers can rest assured that life-cycle communications are being made to customers consistently. BW: The most common complaint is convenience: customers feeling as though they cannot get their vehicle into service when they want, and the fear the service process will take too long to complete. Again, this goes back to consumer’s perception of the experience. Incorporating modern technologies available today help dealers dissipate these opinions, including mobile greeting tools and enhanced processes that speed up the check-in, [making] the experience more seamless for the consumer by not requiring them to leave their vehicle to go into the advisor’s office. These tools ensure service advisors are prepared, giving them quick access to customer and vehicle information, which ultimately gives customers a faster and more personal experience while instilling confidence early in the process. Transparency and information are key. To most consumers, the service department is an area of the dealership that is “off limits,” which mustmean there’s something to hide. Add in the fact that most vehicles today are so complicated, the average person has no idea of the inner workings of even the most common things. Dealerships that are more transparent with consistent communications and that speed up the service process will overcome these obstacles. So their biggest complaint is that they’re not getting the answers they want to one or all of those questions. If dealerships don’t provide the right answers, or if they simply deliver a bare-bones service experience, their CSI scores will pay the price. Xtime research shows that customers’ expectations of the service experience are now higher than ever. Beyond quality repairs, customers expect fair and transparent pricing, dynamic scheduling, and prompt two-way communication—plus special amenities like Wi-Fi or coffee bars. To be successful, dealerships must provide a high-quality experience, how and when their customers want it. DMM: What do you consider the most underutilized form of marketing to promote service departments, and why? JH: Social media. There are very few dealerships [that] utilize social media effectively. If they are leveraging the power of social media, they are mostly broadcasting brand awareness or promoting “likes” for their dealership. What does a like get you? How does it translate into revenue for your dealership? The answer is simple: It doesn’t. At OneCommand, we use social media channels to automatically send timely and relevant ads that are specific and unique to that consumer. If you are due for regularly scheduled maintenance, doesn’t it make sense to send that message to that consumer’s Facebook or Instagram feed? That’s exactly what we do through our integration with Facebook. We combine social media advertisements with our multichannel marketing approach. Service departments simply aren’t utilizing this platform to connect directly with existing customers to promote their service lane. When looking at Facebook and Instagram specifically, recent studies from these platforms have shown the average person spends three or more hours a day on their mobile device, and one in every five mobile minutes is spent on Facebook and Instagram. With social media properties offering this type of engaging environment, where consumers spend most of their time, it’s not hard to see why it should be a utilized channel within a service department’s marketing mix. Why aren’t more service departments leveraging social media to connect with current customers? There’s probably a number of reasons why dealership service departments don’t use social media, such as lack of knowledge, no defined strategy, inability to automate communications, incapable of connecting with current customers . . . the list goes on and on. The first step in creating a social media strategy in a service department is reviewing the entire marketing strategy, and determining how it works in synergy with all the other communication channels. The next step is to partner with a digital marketing vendor to extract DMS data and deploy one-to-one messaging to service customers through social media. Improving service marketing effectiveness and reaching current customers with relevant messaging on their mos-used media channel is that easy. Lastly, dealers should be deploying a multichannel approach for their service marketing. The reason is very simple: Not every customer prefers to consume their marketing in the same way. 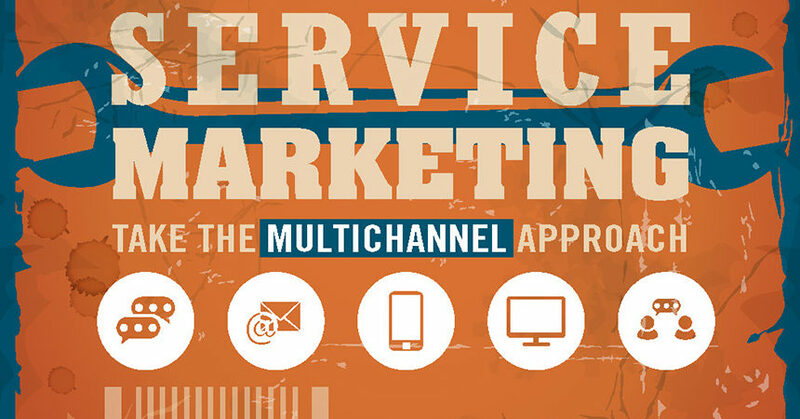 In order for your service department to appeal to the masses, you have to deliver marketing through various channels to ensure your message reaches the right customer through the right communication channel. BW: I actually consider two areas in service marketing underutilized. First, as I mentioned earlier, is a dedicated service website. Most stores have only one dealership-branded site, which is 95% geared toward new car or sales and may include only a small, service-related coupon or call to action. Service content does not get indexed, and as a result, the dealership won’t even come up in search engine rankings for most common service/repair searches online. Search engines rank the majority of national brand service centers and nondealership service facilities in top positions, adding pressure to dealerships already challenged with the customer perception that these providers are more convenient and competitive. The second area is marketing to existing customers. In many cases, dealers still use a shotgun approach with generalized incentives or messages. With today’s technology, dealers have the ability to market customized messages that fit customers’ needs and provide the knowledge they need to make informed owner decisions. Most efficient dealers use a cost-effective multichannel approach to communications that contains strong, informative content and measurements for tracking. JR: Price elasticity is an effective way to promote service departments, but very few dealerships make the most of it. It’s gaining popularity outside the automotive industry, however. Just look at Priceline.com, Hotels.com, or Nordstrom Rack. These companies know that strategic discounts are the best way to sell slow-moving inventory. And just as hotels and clothing stores want to sell excess inventory, most service departments can manage excess shop capacity when they have the right tools. Offering discounts on less-popular appointment times can help fill these gaps, maximize productivity, and bring in more revenue. DMM: Which manufacturers are doing the most to empower their dealers’ service programs, and what do they do that make them stand out from the pack? JH: The truth is, most manufacturers in the automotive industry do a lot to help their dealers promote their service departments. These manufacturers understand what it means to be brand loyal, and want to ensure that consumers are returning to their approved service departments versus independent service facilities for ongoing vehicle maintenance needs. Many manufacturers even provide co-op funds to help promote these service programs. Overall, manufacturers are working to uphold their brand standards, to ensure that the corporate face is consistent across the country, from region to region. They put guidelines in place around what can and must be said within the marketing pieces, as well as what are approved marketing channels, creative, and offers. In addition, some manufacturers allow for the usage of dealer-approved logos and branding elements to ensure both the manufacturer brand and dealership brand are raising top-of-mind awareness among consumers. Also, manufacturers go through an intensive vetting process with service program providers to ensure they are only approving brand messaging that is consistent with their guidelines. These manufacturers are truly empowering their dealers to stand out from the sea of marketers vying for attention. BW: Today’s manufacturers realize the importance of the service department. However, high-line manufacturers seem to be at the forefront, helping their dealers concentrate on customer experience by reshaping the process to create a more efficient and faster service transaction. Their belief is that the most important commodity to consumers is time. By providing a faster, more transparent experience, these manufacturers realize the price factor becomes less of an obstacle. JR: Most manufacturers are making big strides in this area, which is exciting to see. These manufacturers promote or certify tools like tablets in the service drive, offer online scheduling, and provide online or in-lane bill payment options. Some even offer telematics, or “connected car” services. With telematics, a customer receives in-vehicle service notifications, and can schedule an appointment right from their car to address the issue. By providing these tools, manufacturers help dealers deliver the convenience and value customers expect, improving the overall service experience. DMM: What are the most interesting or promising recent technological developments that are likely to benefit automotive service departments in the future, and why? JH: The most exciting technology development, for us here at OneCommand, is to utilize our business intelligence to target consumers with the right message at the right time through the right communication channels. However, we are now also delivering those targeted messages through social media and in-app mobile properties. Since our platform already integrates with a dealership’s DMS to communicate with customers during key touch points in their purchase and ownership life cycles through voice, text, email, and direct mail, we’ll now be able to deliver this same targeted one-to-one relevant messaging to a customer’s social properties, such as Facebook and Instagram, in addition to targeting them with mobile in-app messaging. that is always with them, their mobile device. BW: Fixed operations largely benefit with the industry’s move into the mobile age. The use of tablets for the greeting and write-up process in the service lane allows for more transparency while providing consumers the information needed to speed up the process and transaction. Combined with a multipoint inspection tool that has the capability to provide video evidence of service recommendations in both lane and text message communications, dealers are adding a tremendous amount of credibility to the service upsell opportunity. Furthermore, customers now have the ability to communicate more efficiently with their advisor and get real-time status updates, and to pay online, reducing transaction time and increasing efficiency. JR: The future of the service drive is an integrated, cloud-based system that helps manage the ownership experience. Dealers already know that the ownership experience should be a major priority; 94% of them believe it matters more than the actual repair. However, 83% say their current systems don’t give them the tools to create a superior ownership experience. That’s because most systems aren’t designed to help manage the service experience from start to finish—from marketing and scheduling to service lane inspections, owner communications, and payment. Systems that only manage parts of the experience are fragmented, creating inconsistencies and inaccuracies that damage the ownership experience. A holistic cloud-based system will give dealers a huge competitive advantage in the marketplace.